This formal image of the bride and groom was taken on the grounds of Old Westbury Gardens, Long Island, NY. This magnificent estate is one of the most scenic locations in Nassau County at which to take wedding pictures. 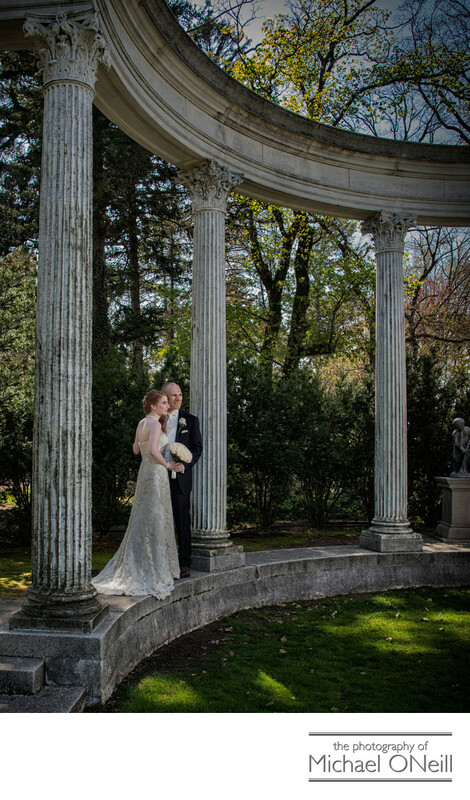 From the formal garden with it’s reflecting pool and stone pillars, to the horticultural gardens with it’s decorative wrought iron gazebo and pond, to the great lawn at the rear of the mansion...Old Westbury Gardens offers up some of the finest backdrops for wedding photos anywhere. The mansion on the property rivals any on Long Island including The Glen Cove Mansion, The deSeversky Mansion, The Vanderbilt Mansion, The Royalton at Roslyn Country Club and Oheka Castle in Huntington, New York. I love taking wedding pictures at locations like this. The variety of backgrounds that the estate offers insures that your wedding pictures will be not only beautiful, but diverse as well. I have created award-winning images at Old Westbury Gardens at dozens of events during my career. If you are looking for a photographer who knows every square inch of this property and has the experience shooting there, look no further. Give me a call and we’ll discuss your plans and desires for spectacular photographs on your big day.